The GPR-3500 features everything that the luxurious VGP-4000 offers except for the virtual piano system in a more reasonable price. Since its cabinet size is 4'2'' it occupies less space than the VGP-4000. The newest ROS V.5 Plus sound source is installed to implement piano sounds that is daringly close to the original, and it is supplemented with the authentic New RHA-3W keyboard. High quality whopper and twitter speakers brings the sensation of a concert hall in its clear and broad sound. 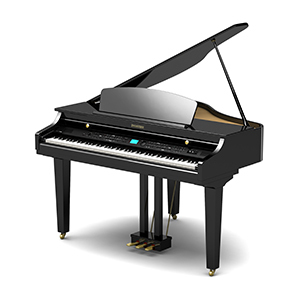 Among its features are an automatic accompaniment system with 80 different rhythmic styles in different genres, including the ability to generate chordal accompaniment in the chosen style.